The central amygdala (Ce), particularly its medial sector (CeM), is the main output station of the amygdala for conditioned fear responses. However, there is uncertainty regarding the nature of CeM control over conditioned fear. The present study aimed to clarify this question using unit recordings in rats. Fear conditioning caused most CeM neurons to increase their conditioned stimulus (CS) responsiveness. The next day, CeM cells responded similarly during the recall test, but these responses disappeared as extinction of conditioned fear progressed. In contrast, the CS elicited no significant average change in central lateral (CeL) firing rates during fear conditioning and a small but significant reduction during the recall test. Yet, cell-by-cell analyses disclosed large but heterogeneous CS-evoked responses in CeL. 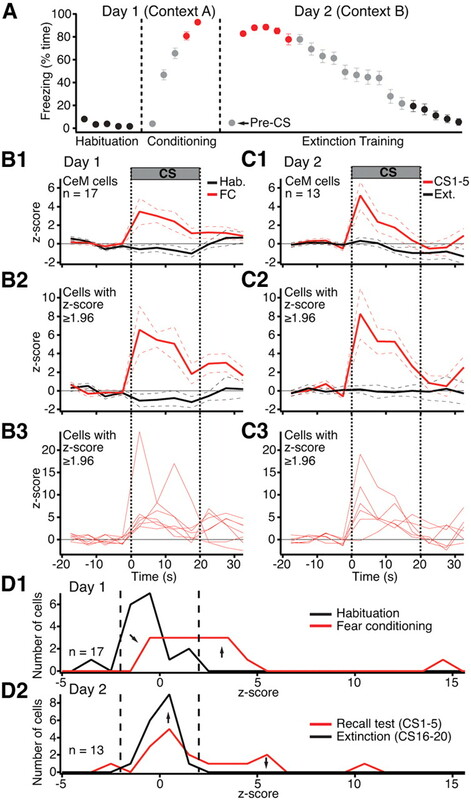 By the end of fear conditioning, roughly equal proportions of CeL cells exhibited excitatory (CeL+) or inhibitory (CeL−) CS-evoked responses (∼10%). The next day, the proportion of CeL− cells tripled with no change in the incidence of CeL+ cells, suggesting that conditioning leads to overnight synaptic plasticity in an inhibitory input to CeL− cells. As in CeM, extinction training caused the disappearance of CS-evoked activity in CeL. Overall, these findings suggest that conditioned freezing depends on increased CeM responses to the CS. The large increase in the incidence of CeL− but not CeL+ cells from conditioning to recall leads us to propose a model of fear conditioning involving the potentiation of an extrinsic inhibitory input (from the amygdala or elsewhere) to CeL, ultimately leading to disinhibition of CeM neurons. The central nucleus of the amygdala (Ce) is essential for acquisition and expression of conditioned fear responses (Davis, 2000; LeDoux, 2000; Paré et al., 2004; Wilensky et al., 2006). However, how the different subnuclei of Ce (medial, M and lateral, L) contribute to fear conditioning is unclear. It is generally agreed that CeM constitutes the main output station of the amygdala for conditioned fear responses. Indeed, with the exception of projections from CeL to the parabrachial nucleus (Petrovich and Swanson, 1997), virtually all brainstem projections of the amygdala originate from CeM (Hopkins and Holstege, 1978; Veening et al., 1984; Cassell et al., 1986; Gray and Magnuson, 1987; Rizvi et al., 1991). For instance, CeM is the sole source of amygdala projections to the periaqueductal gray (PAG), the structure generating the most commonly used measure of conditioned fear, behavioral freezing (LeDoux et al., 1988). However, despite decades of investigations, there is still uncertainty regarding the nature of CeM control over conditioned fear. It is commonly believed that CeM output neurons use GABA but not glutamate as a transmitter. In keeping with this, there are few if any neurons expressing the vesicular glutamate transporters 1 and 2 in Ce (Hur and Zaborszky, 2005; Oka et al., 2008; Poulin et al., 2008). Moreover, although the intensity of GABA immunoreactivity is moderate in Ce (Nitecka and Ben-Ari, 1987; McDonald and Augustine, 1993; Pitkänen and Amaral, 1994), the vast majority of Ce neurons contain GAD65 and 67 mRNA (Pitkänen and Amaral, 1994; Poulin et al., 2008). Consistent with this, several studies combining tract tracing with localization of GABAergic markers at the light or electron microscopic levels concluded that projection neurons of Ce are indeed GABAergic (Pickel et al., 1996; Jia et al., 1997; Jongen-Rêlo and Amaral, 1998; Saha et al., 2002). If CeM output neurons are GABAergic, are conditioned fear responses generated by an increase or a decrease in the firing frequency of CeM neurons during conditioned stimuli (CSs)? The first study to examine this question, in rabbits, reported that fear conditioning reduces the CS responsiveness of Ce neurons with physiologically identified projections to the brainstem (Pascoe and Kapp, 1985). In contrast, the opposite finding was obtained in mice (Ciocchi et al., 2010). The latter report fits well with stimulation and lesion studies, where it was generally found that Ce stimulation enhances, whereas Ce inactivation or lesion suppresses, conditioned fear responses (for review, see Davis, 2000). The present study was undertaken to clarify the nature of Ce control over conditioned fear expression using unit CeL and CeM recordings in rats. Experiments were performed with the approval of the Institutional Animal Care and Use Committee of Rutgers University and in accordance with the National Institutes of Health Guide to the Care and Use of Laboratory Animals. Adult male Sprague Dawley rats (Charles River) were housed individually with ad libitum access to food and water and maintained on a 12 h light/dark cycle. Rats were anesthetized with a mixture of isoflurane and O2, and administered atropine to reduce secretions and aid breathing. In aseptic conditions, rats were mounted in a stereotaxic apparatus with nonpuncture ear bars. A local anesthetic (bupivacaine, s.c.) was injected in the region to be incised. Fifteen minutes later, the scalp was incised, and small burr holes were made in the skull above the amygdala and movable bundles of 6–8 nichrome microwires (13 μm inner diameter, impedance 100–300 kΩ following gold plating) were stereotaxically aimed to CeL and/or CeM. The rats were allowed 1 week to recover from the surgery and acclimated to handling for 2 d.
Fear conditioning and recall testing occurred in different contexts (contexts A and B). For fear conditioning (context A), rats were placed in a dimly illuminated conditioning chamber with a metal grid floor (Coulbourn Instruments) that was enclosed within a sound attenuating chamber. For testing recall, the chamber contained a black Plexiglas floor washed with peppermint soap (context B). On day 0, the rats were habituated to contexts A and B for 15 min each in a counterbalanced manner. On day 1, the electrodes were lowered, and 1–2 h later, the rats received a tone habituation session consisting of 5 CS presentations (20 s, 4 kHz, 80 dB). This was followed by a fear conditioning session where the rats received presentations of 5 CSs, each coterminating with a footshock unconditioned stimulus (0.5 mA, 1 s). On day 2, the rats received an extinction session consisting of 20 presentations of CS alone in context B (CS1–5: recall test, CS16–20: extinction). The electrodes were not moved from day 1 to day 2. Behavior was recorded by a video camera and scored offline. Time spent freezing (immobility, with the exception of breathing) was measured. At the end of behavioral experiments, electrolytic lesions were performed to mark the recording sites. Unit activity was sampled at 25 kHz and stored on a hard drive. Data were analyzed offline with custom software written in Matlab. Spike sorting was performed offline using a clustering algorithm based on principal component analysis and K-means. Histological controls (Fig. 1) revealed that microwire bundles reached CeL or CeM in 33 rats. Offline clustering of unit activity (supplemental Fig. S1, available at www.jneurosci.org as supplemental material) recorded in these rats yielded samples of 107 CeL cells (47 and 60 on days 1 and 2, respectively) and 30 CeM neurons (17 and 13 on days 1 and 2, respectively). Because the spike shapes of most units changed from day 1 to day 2, below it is assumed that different cells were recorded on days 1 and 2. Histological identification of recording sites. Coronal sections of the rat amygdala with electrolytic lesions performed at the end of the experiments to mark the recording sites. A, B, The depicted cases show examples of lesions in CeM (A) and CeL (B). BL, Basolateral nucleus of the amygdala; EC, external capsule; Str, striatum. Figure 2A shows the time the rats spent freezing during habituation, fear conditioning, and the extinction session. As expected, fear conditioning produced a large and significant increase in freezing (CS 4–5: 86.7 ± 2.3%) compared to habituation (CS 1–5: 3.5 ± 0.7%, paired t test, t = 31.24, p < 0.0001). The next day, in a different context, the first few CSs still elicited large increases in freezing (CS 1–5: 84.4 ± 2.4%) that gradually diminished with additional CS presentations (CS 16–20: 12.1 ± 3.4%, paired t test, t = 20.48, p < 0.0001). Note that during the recall test in context B, rats showed little or no freezing (pre-CS: 4.5 ± 1.3%) until the CS was presented (Fig. 2A). This indicates that conditioning occurred and that conditioning was to the tone. The CS responsiveness of CeM neurons increases as a result of fear conditioning. A, Time (average ± SEM) rats (n = 33) spent freezing during the CS in various phases of the behavioral protocol (x-axis). Color-coded symbols indicate the CSs used to average the activity of CeM neurons in B–D. B, C, Peri-CS fluctuations in the firing rates of CeM neurons (5 s bins) on days 1 (B) and 2 (C). Average and ±SEM are shown by solid and dashed lines, respectively. 1, Average of all CeM cells. 2, Average of a subset of CeM cells with significant (p ≤ 0.05) increases in activity during the CS. 3, Activity of the cells used to obtain the averages of 2. D, Frequency distribution of z-scored changes in CS responsiveness on day 1 (D1) and day 2 (D2). To analyze CS-evoked changes in activity, we first computed the firing rate of each unit in 5 s bins, from 20 s before to 40 s after CS onset. We obtained separate averages of the 5 CSs of the habituation phase, the last two CSs of training, as well as the first 5 or last 5 CSs of the extinction session, as indicated by the color-coded symbols of Figure 2A. We then z-scored the data. The results of these analyses are shown for CeM and CeL neurons in Figures 2B–D and 3A–C, respectively. CS responsiveness of CeL neurons. A, B, Peri-CS fluctuations in the firing rates of CeL neurons (5 s bins) on days 1 (A) and 2 (B). The same color code is used as in Figure 1. Average and ±SEM are shown by solid and dashed lines, respectively. 1, Average of all CeL cells. 2, Average of subsets of CeL cells with significantly (p ≤ 0.05) increased or decreased activity during the CS. 3, 4, Activity of the cells used to obtain the averages of 2. C, Frequency distribution of z-scored changes in CS responsiveness on day 1 (C1) and day 2 (C2). The CS elicited opposite responses in CeM neurons (n = 17) during habituation versus fear conditioning: a small but significant (paired t test, t = 2.56, p = 0.02) firing inhibition during habituation (Fig. 2B1, black) and a large increase in activity during fear conditioning (Fig. 2B1, red) (paired t test, t = 2.96, p = 0.009). In parallel, the pre-CS firing rates of CeM neurons decreased 41% from habituation (2.53 ± 0.9 Hz) to fear conditioning (1.48 ± 0.51 Hz, paired t test, t = 2.24, p = 0.04). The next day, CeM neurons (n = 13) still displayed large CS-evoked responses (first 5 CSs, paired t test, t = 2.35, p = 0.03) (Fig. 2C1, red). However, additional CS presentations led to the disappearance of CS-evoked activity (Fig. 2C1, black), paralleling the extinction of conditioned fear. By the end of extinction training, pre-CS firing rates were statistically indistinguishable from those seen during habituation (t test, t = 0.37, p = 0.7). Cell-by-cell analyses of CS-related changes in CEm firing rates supported the average behavior described above. To test this, we separately averaged the z-scores of each cell during the four 5 s bins of the CS and determined whether this average differed by >1.96z from the baseline period in either direction (yielding a significance threshold of p ≤ 0.05). At the end of training and beginning of the recall test, respectively 47 and 46% of the cells exhibited significant CS-evoked increases in firing rates compared to 0 and 7.7% showing significant decreases in activity. When peri-CS histograms were computed with shorter bins (10 ms), it was determined that the latency of tone responses ranged widely with 38% of cells responding as early as 20–30 ms (23.3 ± 3.33 ms) and others much later (106 ± 18.6 ms; range 60–160 ms). During habituation and at the end of the extinction session, none of the cells showed significant increases in activity during the CSs (Fisher exact test, p < 0.0001). Figure 2, B2 and C2, shows the average activity of cells with significant CS-evoked increases in firing rates (for their individual behavior, see Fig. 2B3,C3). A better overall appreciation of task-related changes in the CS responsiveness of CeM neurons can be obtained by considering the distribution of z-scores for all available units (Fig. 2D). During habituation (Fig. 2D1, black), although only one cell showed a significant decrease in firing rate during the CS (i.e., z-score ≤ −1.96), the distribution of z-scores was clearly shifted to the left of 0, reflecting a small CS-evoked inhibition in CeM firing rates. By the end of fear conditioning (Fig. 2D1, red), the distribution shifted to the right, indicating an increased CS responsiveness. The next day, during the early phase of the extinction session (Fig. 2D2, red), the distribution of z-scores was still skewed to the right, reflecting a persistent increase in CS responsiveness. By the end of the extinction session (Fig. 2D2, black), the distribution was nearly centered on 0, indicating the disappearance of CS-evoked activity. Whereas the average CS responsiveness of CeM neurons was consistently increased or decreased in high or low fear states, respectively, the collective behavior of CeL neurons showed an ambiguous relation to fear. Comparing averaged z-scores during the entire CS to the pre-CS baseline period, as we did for CeM cells, yielded changes of inconsistent polarity. For instance, during habituation, CeL cells exhibited an insignificant average reduction in activity during the CS (paired t test, t = 1.6, p = 0.12) (Fig. 3A1, black). At the end of fear conditioning (last two CSs), there was a trend for an increased CS responsiveness, but it did not reach significance either (paired t test, t = 2.87, p = 0.39) (Fig. 3A1, red). However, during the recall test the next day, the CS elicited a significant reduction in CeL firing rates (paired t test, t = 2.07, p = 0.041) (Fig. 3B1, red). With repeated presentations of the CS alone, the amplitude of this CS-evoked inhibition decreased (Fig. 3B1, black), paralleling the extinction of conditioned fear. However, hidden behind these modest changes in the average responsiveness of all CeL cells (average z-scores ≤ 1.2 compared to ∼4 for CeM cells), were huge CS-evoked responses of individual CeL neurons, but of inconsistent polarity. That is, depending on the phase of the behavioral protocol, different CeL cells exhibited large CS-evoked increases or decreases in firing rates, in varying proportions. The evidence supporting this statement is shown in Figure 3, A2–A4 and B2–B4, where we depict the results of cell-by-cell analyses of CeL firing rates. Using the same criterion as for CeM cells, cell-by-cell analyses revealed that during habituation, a similarly low proportion of CeL cells exhibited significant CS-evoked increases (6% or 3 of 47) or decreases (11% or 5 of 47) in firing rates. These proportions were not altered significantly (Fisher exact test, p ≥ 0.11) by the end of fear conditioning (increase, 15%; decrease, 9%). When we focused on the fear conditioning phase and averaged the behavior of these subsets of cells separately, we observed large responses to the CS (Fig. 3A2; for individual cells, see Fig. 3A3,A4). During the recall test the next day, the ratio of CeL cells with excitatory versus inhibitory responses was altered significantly in favor of inhibition. That is, the proportion of CeL cells displaying significant inhibitory responses increased to 27% (Fisher exact test, p = 0.023), whereas the proportion of cells showing excitatory responses did not change appreciably (12%; Fisher exact test p = 0.21). Separately averaging the behavior of these subsets of cells revealed large CS responses (Fig. 3B2; for individual cells, see Fig. 3B3,B4). Further repeated presentations of the CS alone led to the disappearance of significantly responsive CeL cells (inhibition, 2%; excitation, 0%). When peri-CS histograms were computed with shorter bins (10 ms), it was determined that the latency of positive tone responses ranged widely with 33% of cells responding quickly (20 ± 5.7 ms) and others much later (98.3 ± 18.1 ms; range 60–160 ms). As a group, CeL cells with inhibitory responses to the CS showed significantly decreased firing 75 ms after tone onset. Examining the distribution of z-scores for all available units (Fig. 3C) gives a better appreciation of the heterogeneous CS responsiveness of CeL neurons. During habituation (Fig. 3C1, black), the distribution of z-scores was skewed to the left of 0, indicating a small yet insignificant overall reduction in the firing rates of CeL cells during the CS (Fig. 3A1, black). By the end of fear conditioning (Fig. 3C1, red), there was a slight shift of the distribution to the right, consistent with the trend seen in the average of Figure 3A1 (red). The next day, during the early phase of the recall test (Fig. 3C2, red), the distribution of z-scores was extremely wide with a slight asymmetry to the left, reflecting a significant increase in the proportion of CeL cells with inhibitory responses to the CS (Fig. 3B1, red). By the end of extinction training (Fig. 3C2, black), the asymmetry was greatly attenuated, consistent with the reduced inhibition evident in the grand average of all CeL cells (Fig. 3B1, black). Whether we considered all CeL cells as a group, or separately examined units with significant positive or negative responses to the CS, no significant variations in pre-CS firing rates were observed from habituation to fear conditioning or from the early to the late phases of the recall test (paired t tests, t scores ≤ 1.5, p ≥ 0.15). Similarly, no group differences in baseline firing rates were found between cells with positive or negative responses to the CS (t tests, t scores ≤ 1.3, p ≥ 0.19). This study was undertaken to shed light on the behavior of Ce neurons during fear conditioning. Earlier studies on this question reached opposite conclusions, with one study, in rabbits, concluding that brainstem-projecting cells decrease their responsiveness to the CS as a result of fear conditioning (Pascoe and Kapp, 1985) and a second, in mice, reporting the opposite (Ciocchi et al., 2010). Our results indicate that the CS responsiveness of neurons in CeM, where brainstem-projecting Ce cells are concentrated, increases as a result of fear conditioning. In addition, we obtained evidence of fear conditioning-related plasticity in CeL. The significance of these findings is considered below. The overall CS responsiveness of CeM neurons showed a clear relationship to behavior in that it was consistently increased or decreased in high and low fear states, respectively. CeM responses to the CS developed quickly after CS onset and persisted for its entire duration, with some adaptation. Coupled to earlier findings indicating that Ce lesions block the expression of conditioned freezing (for review, see Davis, 2000) and that stimulation of CeM elicits fear responses (Kapp et al., 1982), our results strongly suggest that the expression of conditioned freezing depends on increased activity levels in CeM. Thus, one would expect CeM target neurons in the PAG to display reduced activity during freezing. The significance of this conclusion for the mechanisms of freezing generation will depend on the identity of the PAG cells receiving CeM inputs (local-circuit cells vs projection cells), their transmitter content, and the physiological properties of the brainstem cells contacted by PAG projection neurons. In contrast with the tight relation between fear expression and CS responsiveness found in CeM, average CeL activity did not correlate clearly with fear expression. High fear states could be associated with a slight overall reduction or increase in CeL firing rates during the CS. However, concealed behind the modest average responsiveness of CeL cells were robust but heterogeneous responses of individual CeL cells to the CS. Indeed, in many CeL cells (40% during the recall test), CS presentations elicited large (>3 z-score) firing rate increases or decreases. Of particular interest was our observation that the proportion of CeL cells with significant negative responses to the CS (hereafter termed CeL−) nearly tripled from the end of training to the recall test 24 h later. In contrast, the proportion of CeL cells showing the opposite behavior (hereafter termed CeL+) did not change from training to testing. The markedly increased incidence of CeL− cells during the recall test suggests that fear conditioning leads to overnight synaptic plasticity in CeL and/or its inputs, as proposed earlier (Wilensky et al., 2006). For instance, it is possible that the synapses formed by CeL+ cells onto CeL− neurons undergo strengthening overnight. Alternatively, because the incidence of CeL+ cells did not increase from conditioning to testing the next day, it is possible that the higher proportion of CeL− cells during recall depends not on CeL+ cells but on another inhibitory input such as that arising in intercalated cells, as discussed below. In any event, this pattern of results is compatible with the possibility that CeM disinhibition from CeL cells, although not necessary for expression of freezing during the conditioning phase, is recruited during expression of fear the following day. Considering that CeL cells are GABAergic (see Introduction), that they inhibit each other (Lopez de Armentia and Sah, 2004), and that some project to CeM (Petrovich and Swanson, 1997), it is possible that the increased CS responsiveness of CeM neurons is caused by decreased inhibitory inputs from CeL− cells (Ehrlich et al., 2009). At odds with this possibility, however, a similar proportion of CeL− and CeL+ cells were seen at the end of fear conditioning when freezing levels were high. Also, during the recall test, the majority (60%) of CeL cells did not change their firing rates during the CS, and many (13%) showed positive CS responses. Therefore, in order for the CS-related firing of CeM cells to mostly depend on disinhibition from CeL, the number and/or strength of synapses formed by CeL− cells with CeM neurons would have to be significantly greater than for other CeL cells. Therefore, evaluation of CeL's role in the generation of conditioned freezing awaits analysis of the strength of the inhibitory connections formed by CeL+, CeL−, and CS-unresponsive CeL cells. Despite these uncertainties however, the notion that CeM disinhibition plays a role in conditioned fear should not be discounted. As lateral nucleus of the amygdala (LA) does not project directly to CeM, potentiated LA inputs about the CS (Quirk et al., 1995) can only reach CeM via other synaptic relays. In principle, the basal nuclei might fulfill this role, since they receive excitatory inputs from LA and project to CeM (Smith and Paré, 1994; Paré et al., 1995; Pitkänen et al., 1997). However, inactivation of the basal nuclei with muscimol does not block the expression of conditioned fear (Herry et al., 2008; Amano et al., 2010). Besides CeL, another population of GABAergic cells receives glutamatergic inputs from LA and projects to CeM: intercalated cells. These inhibitory neurons occur as small distributed cells clusters at the BLA–CE border (Millhouse, 1986) and they contribute topographically organized projections to Ce (Paré and Smith, 1993; Royer et al., 1999, 2000; Marowsky et al., 2005; Geracitano et al., 2007). That is, more dorsally located clusters (ITCd) project to CeL, whereas more ventrally located ones (ITCv) mainly project to CeM (Amir et al., 2010). In addition, ITCd cells project to ITCv neurons (Amir et al., 2010). Because LA projects to ITCd but not ITCv neurons (Royer et al., 1999, 2000), CS presentation might cause the glutamatergic activation of ITCd cells, leading to the inhibition of CeL− and ITCv neurons, with the final result of disinhibiting CeM neurons. This hypothesis raises the possibility that the blockage of fear acquisition by pretraining inactivation of Ce with muscimol (Wilensky et al., 2006) might in fact be secondary to muscimol diffusion to the adjacent ITCd, interfering with activity-dependent potentiation of LA inputs to ITCd cells. A challenge for future experiments will be to test these ideas. We thank Dr. T. Sigurdsson for his advice on data analysis and unit recording procedures. This work was supported by R01 Grant MH-083710 from the National Institute of Mental Health. (2010) The basal nuclei of the amygdala are involved in conditioned fear extinction but not expression. Soc Neurosci Abstr 36:808–24. (2010) Physiological identification and infralimbic responsiveness of rat intercalated amygdala neurons. Soc Neurosci Abstr 36:808–23. (1986) Neuronal architecture in the rat central nucleus of the amygdala: a cytological, hodological, and immunocytochemical study. J Comp Neurol 246:478–499. (2010) Encoding of conditioned fear in central amygdala inhibitory circuits. Nature 468:277–282. (2000) in The amygdala, The role of the amygdala in conditioned and unconditioned fear and anxiety, ed Aggleton JP (Oxford UP, Oxford), pp 213–287. (2007) Synaptic heterogeneity between mouse paracapsular intercalated neurons of the amygdala. J Physiol 585:117–134. (1987) Neuropeptide neuronal afferents from the bed nucleus of the stria terminalis and central amygdaloid nucleus to the dorsal vagal complex in the rat. J Comp Neurol 262:365–374. (1978) Amygdaloid projections to the mesencephalon, pons and medulla oblongata in the cat. Exp Brain Res 32:529–547. (2005) Vglut2 afferents to the medial prefrontal and primary somatosensory cortices: a combined retrograde tracing in situ hybridization study. J Comp Neurol 483:351–373. (1997) Evidence of gamma-aminobutyric acidergic control over the catecholaminergic projection from the medulla oblongata to the central nucleus of the amygdala. J Comp Neurol 381:262–281. (1998) Evidence for a GABAergic projection from the central nucleus of the amygdala to the brainstem of the macaque monkey: a combined retrograde tracing and in situ hybridization study. Eur J Neurosci 10:2924–2933. (1982) Cardiovascular responses elicited by electrical stimulation of the amygdala central nucleus in the rabbit. Brain Res 234:251–262. (1988) Different projections of the central amygdaloid nucleus mediate autonomic and behavioral correlates of conditioned fear. J Neurosci 8:2517–2529. (2004) Firing properties and connectivity of neurons in the rat lateral central nucleus of the amygdala. J Neurophysiol 92:1285–1294. (2005) A specialized subclass of interneurons mediates dopaminergic facilitation of amygdala function. Neuron 48:1025–1037. (1993) Localization of GABA-like immunoreactivity in the monkey amygdala. Neuroscience 52:281–294. (1986) The intercalated cells of the amygdala. J Comp Neurol 247:246–271. (1987) Distribution of GABA-like immunoreactivity in the rat amygdaloid complex. J Comp Neurol 266:45–55. (2008) Neuroanatomical and neurochemical organization of projections from the central amygdaloid nucleus to the nucleus retroambiguus via the periaqueductal gray in the rat. Neurosci Res 62:286–298. (1993) The intercalated cell masses project to the central and medial nuclei of the amygdala in cats. Neuroscience 57:1077–1090. (1995) Intra-amygdaloid projections of the basolateral and basomedial nuclei in the cat: Phaseolus vulgaris-leucoagglutinin anterograde tracing at the light and electron microscopic level. Neuroscience 69:567–583. (1985) Electrophysiological characteristics of amygdaloid central nucleus neurons during Pavlovian fear conditioning in the rabbit. Behav Brain Res 16:117–133. (1997) Projections from the lateral part of the central amygdalar nucleus to the postulated fear conditioning circuit. Brain Res 763:247–254. (1996) GABAergic neurons in rat nuclei of solitary tracts receive inhibitory-type synapses from amygdaloid efferents lacking detectable GABA-immunoreactivity. J Neurosci Res 44:446–458. (1994) The distribution of GABAergic cells, fibers, and terminals in the monkey amygdaloid complex: an immunohistochemical and in situ hybridization study. J Neurosci 14:2200–2224. (1997) Organization of intra-amygdaloid circuitries in the rat: an emerging framework for understanding functions of the amygdala. Trends Neurosci 20:517–523. (2008) Enkephalin co-expression with classic neurotransmitters in the amygdaloid complex of the rat. J Comp Neurol 506:943–959. (1995) Fear conditioning enhances short-latency auditory responses of lateral amygdala neurons: parallel recordings in the freely behaving rat. Neuron 15:1029–1039. (1991) Connections between the central nucleus of the amygdala and the midbrain periaqueductal gray: topography and reciprocity. J Comp Neurol 303:121–131. (1999) An inhibitory interface gates impulse traffic between the input and output stations of the amygdala. J Neurosci 19:10575–10583. (2000) Polarized synaptic interactions between intercalated neurons of the amygdala. J Neurophysiol 83:3509–3518. (2002) Somatostatin immunoreactivity in axon terminals in rat nucleus tractus solitarii arising from central nucleus of amygdala: coexistence with GABA and postsynaptic expression of sst2A receptor. J Chem Neuroanat 24:1–13. (1994) Intra-amygdaloid projections of the lateral nucleus in the cat: PHA-L anterograde labeling combined with postembedding GABA and glutamate immunocytochemistry. J Comp Neurol 342:232–248. (1984) The organization of projections from the central nucleus of the amygdala to brainstem sites involved in central autonomic regulation: a combined retrograde transport-immunohistochemical study. Brain Res 303:337–357. (2006) Rethinking the fear circuit: the central nucleus of the amygdala is required for the acquisition, consolidation, and expression of Pavlovian fear conditioning. J Neurosci 26:12387–12396.